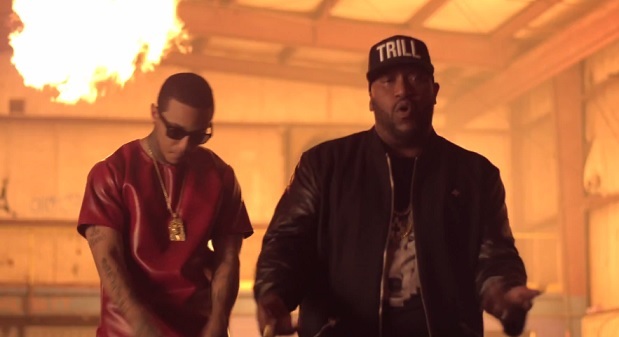 Bun B is back with a new music video for “Triller” featuring Kirko Bangz. The Michael Artis directed visual finds the Houston rapper hitting the streets to make some moves and stack up some dough. Take a look as the camera follows the Southern boss around on a busy day and as he reconvines with Bangz to do a little stunting in front of some luxury whips and pyrotechnics. The H-Town legend’s latest single, “Triller,” is featured on the rapper’s new Trill O.G. The Epilogue LP. This entry was posted in Music, Video and tagged Bun B, kirko bangz, Music Video, the epilogue, trill O.G., triller. Bookmark the permalink.